This Note discusses in detail – or begins to discuss in detail – the somewhat extravagant thoughts in "Grossman (Lev), Kurzweil (Ray) - 2045: The Year Man Becomes Immortal". It ought to range more widely across the Transhumanist literature. The footnotes in the Write-up for the paper link to the sections in this Note3. It is currently very much work in progress. This book has been criticised by Searle – see NY Books: Searle - I Married a Computer (https://www.nybooks.com/articles/1999/04/08/i-married-a-computer/). Unfortunately, only the opening section is available for free. But Kurzweil’s site (Searle: I Married a Computer - Defunct) seems4 to hold an updated version. → Ray Kurtzweil (Editor) — Are We Spiritual Machines? (Kurzweil: Are We Spiritual Machines? (http://www.kurzweilai.net/ebooks/are-we-spiritual-machines)). This contains (as Chapter 2) the critique by Searle noted above. There’s an old Time article “Can Machines Think?” – stimulated by the Kasparov vs Deep Blue chess match (at Time: Can Machines Think? (http://content.time.com/time/magazine/article/0,9171,984304,00.html)). Are there really no reasons to doubt that their onward exponential growth is really never going to end? Miniaturisation of components has to stop soon due to QM effects. So, a radically-new technology is needed. Some ideas are there, but we might get “stuck” on their delivery, as has been the case for controlled nuclear fusion (Wikipedia: Fusion Power (https://en.wikipedia.org/wiki/Fusion_power#Current_status)), which in the 1950s was expected soon, in the 1970s by 2000 and in 2006 “not within 100 years”. See Cyborgs for my thoughts on the matter. At this stage of the argument, it’s not clear how intelligent machines will help repair our bodies and brains (especially “indefinitely”). Usually nanotechnology is invoked at this stage (see Wikipedia: Nanotechnology (https://en.wikipedia.org/wiki/Nanotechnology) for an overview). Now, it’s true that intelligent machines would be needed to manufacture, and probably program, these myriads of tiny, very specialised machines, but the possibilities are very schematic. There’s no evidence that anything workable is around the corner. It looks like the free eBook by Eric Drexler Engines of Creation 2.0 — The Coming Era of Nanotechnology (Drexler: Engines of Creation - Defunct) might prove useful. Well, philosophically-speaking, this is an outrageous idea. It depends on what we are, and we’re almost certainly not software, though software is important to us. And there are issues of identity – since software is easy to copy, and copies aren’t identical, what reason would an individual have for thinking any particular installed copy was (identical to) him? 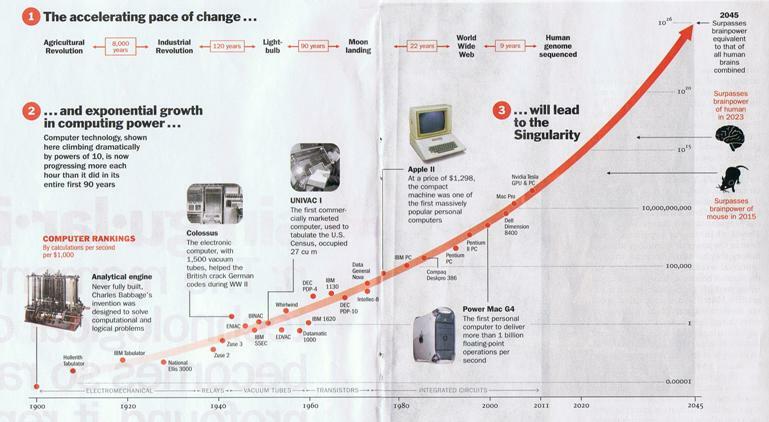 See Wikipedia: Moore's Law (https://en.wikipedia.org/wiki/Moore%27s_law). Timestamp: 07/04/2019 10:02:56. Comments to theo@theotodman.com.